This rare secretary cabinet was designed by Willem Penaat (1875-1957) and manufactured by Metz & Co in Amsterdam in 1930. Penaat worked as a furniture and interior designer for the upscale Metz & Co store for over 25 years, working closely with Elmar Berkovich who was the cabinetmaker in charge of the furniture department. From 1925 onwards, Penaat started to emphasize simplicity, mobility and multi-functionality in his designs, in line with the changing attitudes about modern living. 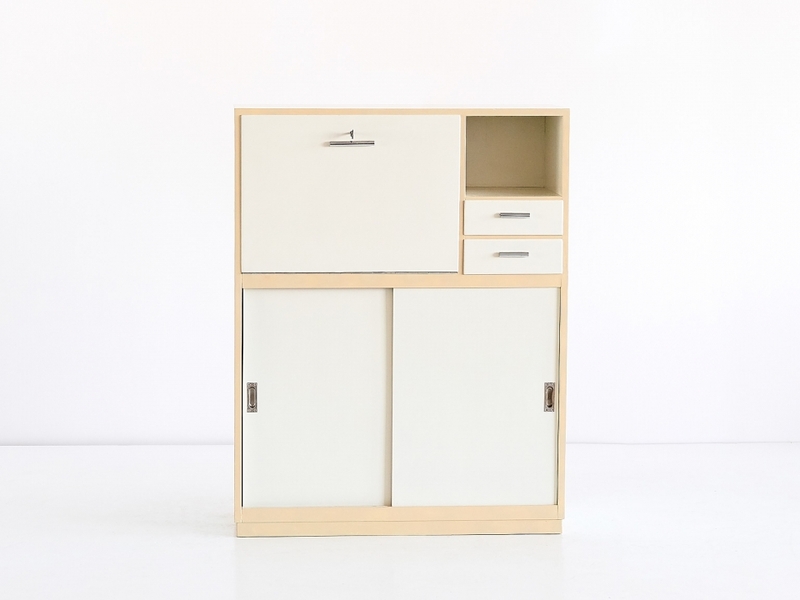 With its several storage options and fold out desk, this asymmetrical geometrical cabinet is a perfect example of his modernist approach. 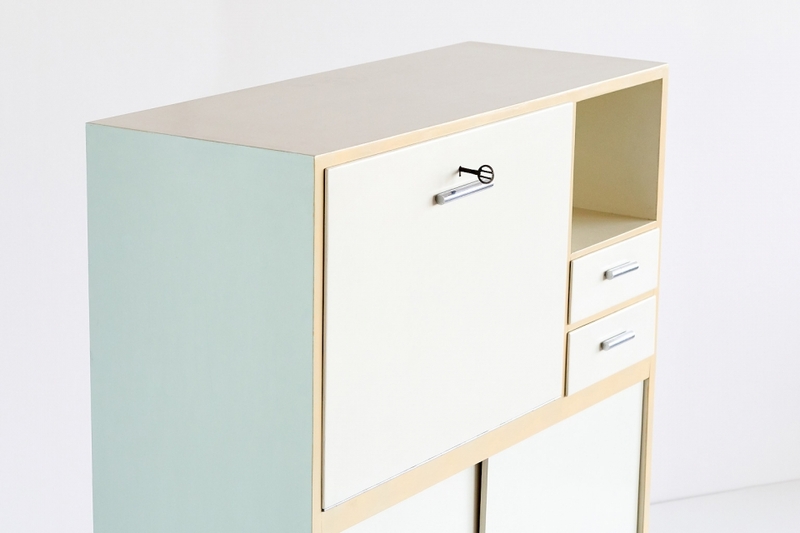 The exterior and interior of the piece is made of beech wood lacquered in a variety of pastel colors including white, yellow, green and a light blue-gray. The original, soft colors contrast beautifully with the nickel and chrome handles. Penaat frequently consulted the De Stijl painter Bart van der Leck on which color schemes to use for his designs. The drawing of this particular cabinet is part of the Metz & Co archives which can be found in the Amsterdam City Municipal Archives. About Metz & Co: Metz & Co was mostly known as an upscale department store, however from 1910 until the 1960s they also produced various furniture and textile items. The Scope of this production was limited and the production methods were mostly in hands of craftsmen. The firm became outstanding due to its remarkable policy on design and its extensive cooperation with artists, of which the latter also held Metz in great esteem. The store’s owner and director Joseph de Leeuw hired Willem Penaat in 1924. His furniture designs were initially allied to the rationalistic design of H.P. Berlage and K.P.C. de Bazel. Around 1930 de Leeuw had come in contact with the architect Gerrit Rietveld and Bart van der Leck. These meetings ushered in a new period for the company and the furniture department continued to Stand out most prominently, with the sober and luxurious furniture by Penaat, the experimental furniture of Rietveld and the colorful carpets by Van der Leck. During that time a range of other artists and architects were invited to design products, among them J.J.P Oud, Mart Stam, Jean Burkhalter and Sonia Delaunay. In this period, the Metz workshops offered its designers and artists the valuable opportunity to test their ideas on design in practice. Literature references: Willem Penaat: meubelontwerper en organisator, Corrie van Adrichem, Uitgeverij 010, Rotterdam, 1988. Metz & Co: de creatieve jaren, Petra Timmer, Uitgeverij 010, Rotterdam, 1995. Metz & Co Archives, Amsterdam City Archives, Accession Number 977.2.9.2.1.1.1. Condition: Excellent. Fully original condition. Wear consistent with age and use.